Today, we had our usual 8 am Sunday Eucharist. However, being that it is Palm Sunday, it had a bit more flair! We had a procession through the little convent chapel, into the lobby, outside and around a tree, and then back into the chapel. People held their palm branches (woven into the shape of a cross) as voices tentatively warbled the hymn, “All Glory Laud and Honour” a cappella. The cavalcade was led by a visiting Sister from the Chemin Neuf community in France. She was called “The Crucifer” – which, if I understand correctly, basically means she carried a shiny cross on a stick. 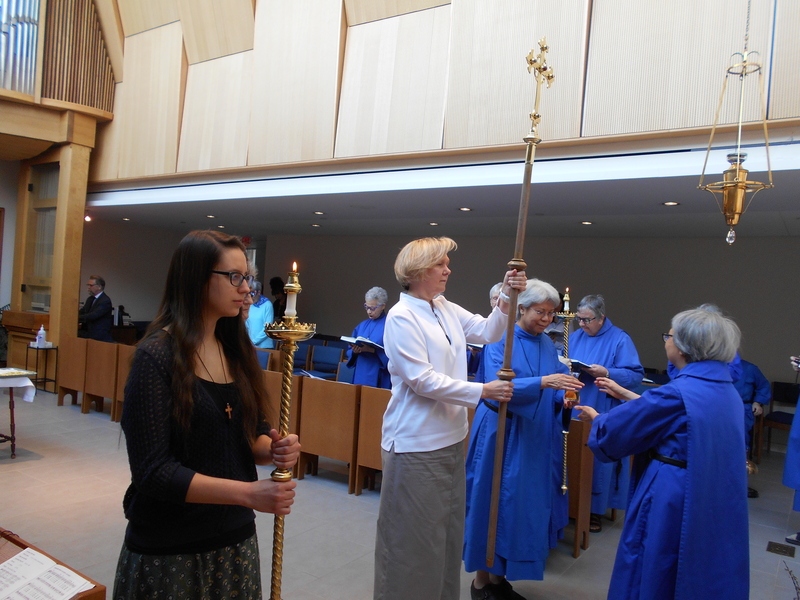 I had the nervous delight of being one of the people on either side and slightly behind her, bearing one of the two “torches.” I thought I would mess up, having no real history as a “high church” Anglican, but I just copied the quietly confident novice-Sister who was bearing the other torch parallel me. But, alas, things quickly became All Glory Laud and Horror as our troupe re-entered the chapel and we torch bearers stopped on either side of the podium in the center of the room to wait out the rest of the hymn and – what do I spy? That’s right. You guessed it. The very content of my nightmares: a ginormous spider. Marching, in good processional form, right up behind me. I am trapped. I abandon decorum and cannot be sure what profanity (or if any at all) is breathed out as I attempt to push it away with my slippered foot. The spider grasped the knit wool and followed my foot half way back to my standing place before (Thank the merciful Lord) abandoning ship. It stumbled toward me again and I picked up my skirt and moved around it, letting it pass by; managing, this whole time, not to spill a single bit of wax or set anyone aflame. In fact, perhaps I was more discreet than I felt on the inside, because people went on singing, seeming not to notice a thing. Needless to say, I made it. And, despite my distaste for the thing, I was pleased that not a single Sister stomped on it. The worst the creature got was a bewildering encounter with my slipper and an unnoticed look of disapproval from over-top a Sister’s glasses. wonder-full!!! I love it – your telling of the story – not the spider.